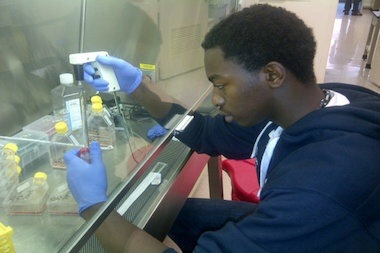 Chicago High School for Agricultural Sciences graduate Keven Stonewall, of Ashburn, is hoping to develop a cure for colon cancer. He's now a rising sophomore at the University of Wisconsin. ASHBURN — Keven Stonewall likes to say "innovation doesn't have an age," which makes sense considering the 19-year-old could be on his way to curing colon cancer. Working at a Rush University lab while still in high school, the Ashburn native revealed a critical age-related drawback in an experimental vaccine aimed at preventing colon cancer in mice. A vaccine that could work on seniors is now being developed. Stonewall "should be heralded for helping to develop more effective colon cancer treatments that will impact the elderly, the population that is most susceptible to colon cancer," said Carl Ruby, the Rush University professor who operated the lab where Stonewall did his research. "He has all the tools. He will go far." Stonewall has spent the last year at the University of Wisconsin in Madison, where he's a rising sophomore and further researching a colon cancer vaccine that could eventually be tested on humans — and "possibly down the road eradicate colon cancer." "I am very passionate about doing colon cancer research," Stonewall said. "If it works on humans, I would be overwhelmed. My whole life would flash in front of me." 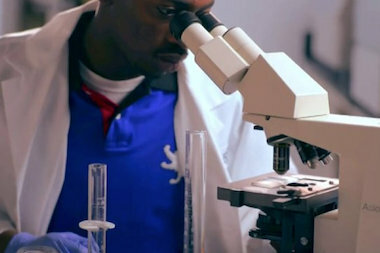 Stonewall's love for science began during a fifth-grade science class at Chicago International Charter School's Wrightwood campus, where he was immediately fascinated by looking at cells under a microscope. That Christmas, he received four microscopes as gifts. His commitment to eradicating colon cancer came during his freshman year at the Chicago High School for Agricultural Sciences, when a good friend's uncle was diagnosed with the disease. Stonewall watched his friend transform from a model student to one with bad grades and trouble outside the classroom as his uncle became more ill and eventually died. "I saw the impact on him and how it impacted his life," Stonewall said. "Cancer has taken over a whole bunch of lives, and I felt like I needed to step up and do something about it." Before his senior year, Stonewall started his research on a potential colon cancer vaccine while doing an internship at Rush on the Near West Side. He worked in the lab of Ruby, an assistant professor in the departments of Immunology/Microbiology & General Surgery. After reviewing research suggesting that a chemotherapeutic agent might help kill off other kinds of cancer cells — and promote a healthy immune response — Stonewall set out to test whether the potential colon cancer vaccine worked on both younger and older mice. He used a high concentration of mitoxantrone — a prescription drug that treats certain types of cancers. He administered this potential vaccine to young and old mice and then injected the vaccinated mice with aggressive colon cancer cells. He then measured responses, including the makeup of key immune cells called dendritic cells, as well as tumor growth and survival rates. Stonewall noticed that usually after three days of living with the vaccine, all of the young mice's tumors were eliminated, and they demonstrated immunity to colon cancer. But none of the older mice were protected, leading to tumor growth. His research helped determine a need for a vaccine that would work on older subjects, scientists said. Ruby said this finding is clinically important since more than two-thirds of colon cancer patients are elderly. "It's always exciting to have young kids come through the laboratory that have a passion for science and have potential for great things," Ruby said. "Being a mentor for him makes my day." Andrew Zloza, a Rush assistant professor in the departments of Immunology/Microbiology & Internal Medicine, said Stonewall's work "has suggested that drugs may not work the same in people of different ages." "This means that age may have to be a factor when physicians choose which drugs and what dosage to use in people of different ages," said Zloza, also co-director of Rush's HIV and Cancer Scientific Working Group. "This is something already taken into account for children versus adults, but now adults may need to be separated into groups by age." Zloza, who was not involved with Stonewall's research, added: "I think that the work Keven is doing goes far beyond helping us understand how colon cancer treatments and vaccines work — it brings into light a paradigm-shifting call to action — whereby the way we treat adults may have to change to account for age." 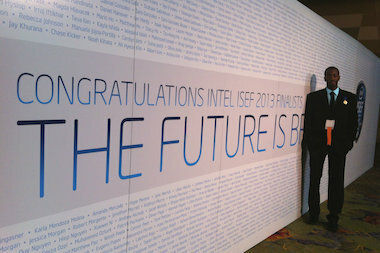 Stonewall's colon cancer vaccine findings came about from a national science and engineering contest sponsored by Intel in 2013. His work earned Stonewall numerous awards. "With the data collected so far, the research does in fact have the potential to make it into human trials and possibly down the road to eradicate colon cancer," Stonewall said. "With that being said, the potential vaccine would have to go under years of clinical trials and testing to ensure the safety and effectiveness of the vaccine." At Wisconsin, Stonewall is known as the "colon cancer guy" around campus. That's according to Stonewall and Valyncia Raphael, his mentor with Wisconsin's Posse Foundation — a leadership program for students from urban backgrounds. "It's weird at times having that title, and sometimes I feel I shouldn't be given a title," said Stonewall, who said he hears the moniker from students and professors. "But it's also kind of cool at times because people actually look at what I'm doing, and it feels really good in my heart." Raphael, a former Badgers softball player who is a graduate assistant with the Posse Foundation, said Stonewall is "dynamic, incredibly disciplined and self-motivated." "His goal is legitimately to cure cancer," Raphael said. "Everybody in the Posse [program] looks at Keven as a person who's going to legitimately change the world." That statement doesn't surprise Stonewall's high school guidance counselor, LaShawndra Pointer. The West Pullman resident said Stonewall has "stood out" since she first met him freshman year at the Far Southwest Side high school in Mount Greenwood. Pointer said Stonewall's accomplishments in high school led to Stonewall earning six academic scholarships, including one from the Posse Foundation, to attend Wisconsin. "What I've noticed about him is if he does not achieve a certain goal, he doesn't allow that to set him back," Pointer said. "We expect great things, to say the least, from him." Stonewall, a biomedical engineering major, is back in Chicago for the summer to serve as an intern at the University of Chicago Comprehensive Cancer Center. Stonewall is working with U. of C. oncologists and learning about other forms of cancer. It fits into his long-term goal of becoming an oncologist. Stonewall credits his parents for his academic discipline. His father, Keven Sr., and mother, Cawanna, are both city natives and educators within Chicago Public Schools. Stonewall believes he's inspiring his two younger sisters — Crystal, 17, and Chiya, 6 — and brother — Kristopher, 16 — as well. Crystal, a rising senior at Ag School, is conducting cancer research as an intern at Northwestern this summer. Kristopher plans to be a mechanical engineer. Stonewall said Chiya is claiming "she wants to be the president."